James Shirley. Licensed under Public Domain via Wikimedia Commons. 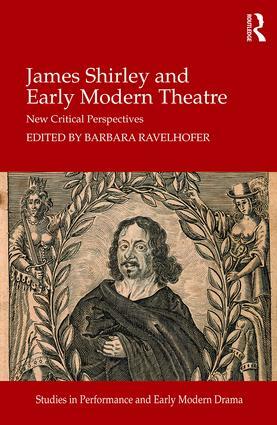 James Shirley (1596-1666) is one of the most significant dramatic writers of the late English Renaissance. He had an easy command of tragedy, comedy, tragicomedy, masque, pastoral, morality, and neo-miracle genres. His non-dramatic works include poems and grammars. His style was admired by Thomas May, John Ford, Philip Massinger, and the actors Garrick and Kemble. Adaptations from the late seventeenth to the nineteenth century attest to Shirley’s lasting popularity. He also inspired great musicians such as William Lawes and Matthew Locke. Shirley’s famous poem “The Glories of Our Blood and State” from his entertainment The Contest of Ajax and Ulysses is said to have seized Oliver Cromwell “with great terror”. Caroline drama would be unthinkable without Shirley. Charles I personally suggested the plot for Shirley’s highly successful 1633 comedy The Gamester. Shirley wrote for a wide variety of venues, ranging from the Blackfriars Theatre to Banqueting House, Whitehall, and the first public playhouse in Dublin. He was fond of strong yet nuanced female characters. Critics still appreciate his elegant craftsmanship, his fast-paced, witty dialogues, and his detached portrayal of social manners. This collection considers Shirley within the culture of his time, and highlights his contribution to seventeenth-century English literature as poet and playwright. Individual essays explore Shirley’s musical theatre and spoken verse, performance conditions, female agency and politics, and the presentation of his work in manuscript and print. Collectively, the essays assemble a larger picture of Caroline drama, showing it to be more than simply a nostalgic endgame, its poets daintily sipping hemlock on the eve of the Civil Wars. Shirley’s literary versatility and long life, spanning the last days of Queen Elizabeth I to the ascension of Charles II, make him an ideal writer through whom to examine the distinctive qualities of Caroline theatre. Favourably reviewed in Early Theatre and Review of English Studies. For more information about the following clips from Shirley’s plays, see our videos page. This site is maintained by the Department of English Studies, University of Durham.